At the Chan Zuckerberg Initiative, we’re focused on building a new kind of philanthropy that leverages technology to be part of the solution for some of the world’s toughest challenges – from preventing and eradicating disease, to reforming the criminal justice system, to supporting teachers in their efforts to improve learning experiences for students. Our co-founder, Priscilla Chan, saw firsthand the need to take a holistic, “whole child” approach to teaching through her experience as both a teacher and pediatrician. That understanding, and the latest research and learnings in the field, have shaped the core of our Education work, which is aimed at ensuring that every student — not just a lucky few — gets an education that’s tailored to their needs and supports every aspect of their development. Today, we’re pleased to announce that Sandra Liu Huang will serve as our new Head of Education to help shepherd and lead this growing, interdisciplinary body of work. A daughter of immigrants from a family of educators, Sandra recognizes that education is key to opening doors of opportunity – it’s what inspired her to join CZI in support of our Education mission: to ensure every young person enters adulthood with the skills and abilities they need to reach their full potential, and that every teacher is equipped with the tools and research they need to help get students there. Across all of our work at CZI, collaboration across disciplines is key, and our unique approach is to use technology, grantmaking, impact investments, policy and advocacy to help reach our goals. In education, this multi-pronged, collaborative approach is what we believe will ultimately help us achieve our mission. “At CZI, we’re all about collaboration across disciplines — including how we can point the promise of technology toward solving the toughest challenges in education today. With her deep background in managing complex, interdisciplinary teams and building tools and products that help people learn, Sandra Liu Huang is the ideal leader to carry forward our vision for what’s possible in education,” said Priscilla Chan, Co-founder of the Chan Zuckerberg Initiative. 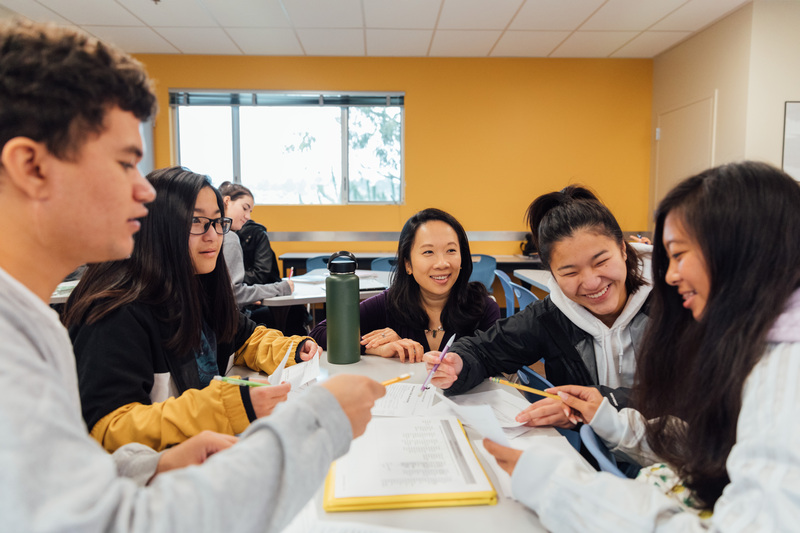 “Education changed my family’s path and I am humbled by the opportunity to work more closely with educators, researchers, and our grantee partners to build a deeper understanding of how kids learn and develop and to figure out new ways to share those practices and tools more widely across diverse communities,” said Sandra Liu Huang. Since joining CZI in 2017 as our Head of Product and Technology, Sandra has overseen the Education technology team’s partnership with the Summit Learning Program (SLP), focused on improving online tools to empower teachers and to help students learn in a way and at the pace that works best for them. Within the SLP, our engineers work with teachers across the country to help build and improve these free tech tools that enhance the quality of student-teacher interactions. Over the past three years, the SLP has grown from serving 19 schools to more than 380 with promising results. For example, the Pasadena Independent School District in southeastern Texas started piloting the Summit Learning Program in 2015. In the past two years, seventh graders there who were the furthest behind their peers made a 17 percent gain on the state math assessment — and a 20 percent gain in reading. As Head of Education at CZI, Sandra will lead an interdisciplinary team of 100 educators, researchers, and technologists focused both on building useful software tools that empower teachers to deliver more personalized learning experiences for students and on grantmaking and research that advances “whole child” and evidence-based approaches in education. Sandra will be supported by our talented education team, including Dr. Brooke Stafford-Brizard, Dr. Bror Saxberg, Katrina Stevens, Margarita Florez, Jon Deane and Justin Barra. Sandra has spent her career focused on building tools and products that help people learn. Before joining CZI, she was the head of product at Quora, a platform for gaining and sharing knowledge. Earlier in her career, Sandra led product teams at Facebook and Google. She holds bachelors and masters degrees from Stanford University. She and her husband have two children.